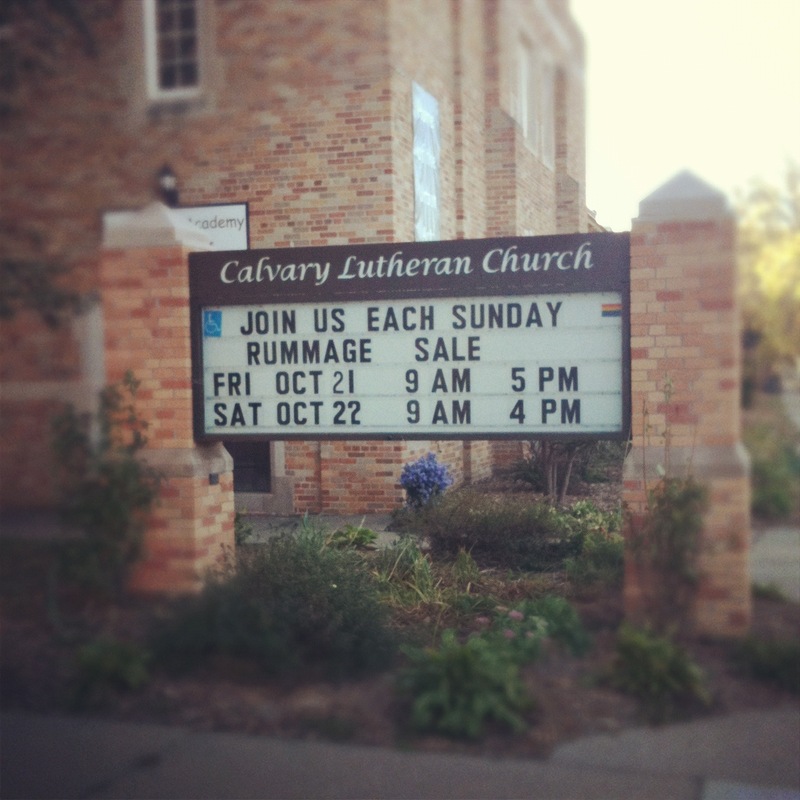 The Lutheran church down the street from me is holding their annual rummage sale this weekend. I made a quick pit stop there on my way to work and was quite impressed with theprices and selection. I scored a couple vintage dresses, a Minnesota state flag, a pair of beautiful gold hoop earrings, some mugs and gifties for Mighty Swell grab bags and a drying rack for dishes (my dishwasher kicked the bucket week!) all for under $8. 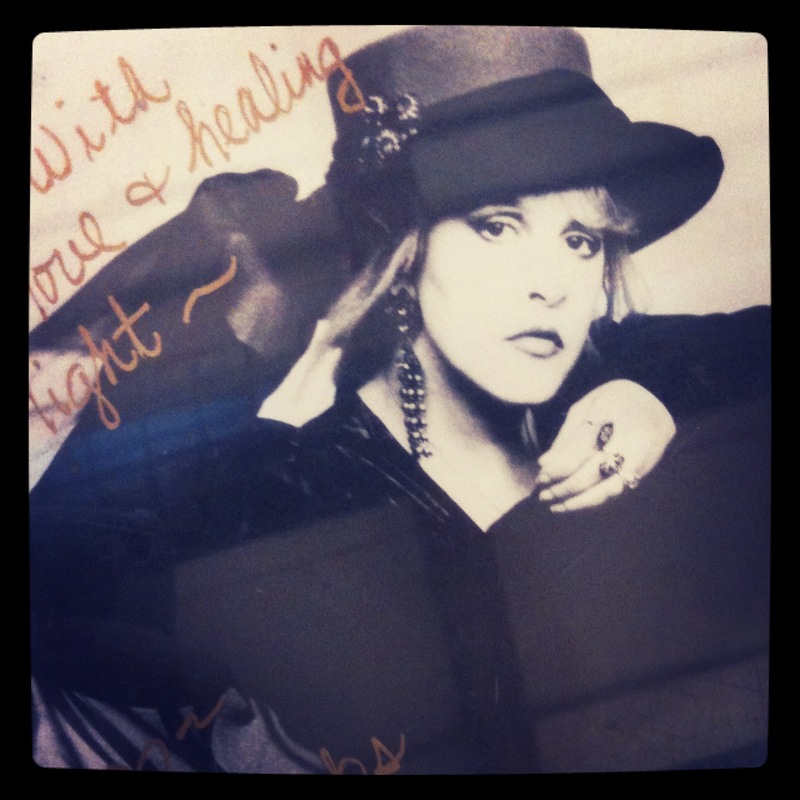 The surprise find of the morning was this autographed, framed photo of Stevie Nicks I got for 50 cents. (50 cents!!!) The frame is fugly, but that’s an easy enough fix. Anyway, there was a ton of stuff left this morning and they had boxes and boxes still to put out. If you’d like to check out this sale, here’s what you need to know. Hours: Friday, 9 a.m. to 5 p.m., Saturday, 9 a.m. to 4 p.m.
On Saturday, from 9:00 a.m. to noon everything is half-price; from noon to 3:00 p.m. it’s $1/bag and $2/box; from 3 – 4:00 p.m. everything that is left is free. Proceeds raised go towards the church’s community programs, including Beechwood Inc., the Twin Cities Women’s Choir and Crossroads Community Organization. Reasonably priced breakfast treats, coffee, soup, hot dogs, BBQ sandwiches and homemade desserts are also available. I’ll definitely be stopping back tomorrow afternoon to shop the bag sale and pick up an apple pie bar and cup of coffee. I hope y’all are having fantastic Fridays so far! This entry was posted in Uncategorized and tagged rummage sale, thrifting by highplainsthrifter. Bookmark the permalink. I kind of hate you for that finding that Stevie photo. I mean, I am happy for you, but it is hard to recognize that through this burning jealous rage. If Ur Looking To Sell That Stevie Poster, Let Me Know!!! I’m A Collector & Also Know Her Signature & Writing Very We’ll Cuz There Are A Ton Of Fakes Out There. She Is Actually One Of The Harder To Get To Sign. But From What Little I Could See On It’s, It Looks Legit. The Karma Gods Were Smiling On U That Day For Sure!